Mad about Mushrooms . . .: Welcome! As I sit at my computer at our log home in Port Orford, composing these lines, it’s New Year’s Day, 2009, a hearty winter storm is raging outside, mushroom season (such as it was) is nearing an end, and it seems an appropriate time to look back, and forward. It’s been a fascinating journey so far. Since we began in mid - 2007, we’ve been astonished at how our readership has grown. We never imagined that we would have readers all over the country, as well as international readers from as far away as Europe, China, India and Africa, somehow finding our website and taking the time to explore it. We’ve tried to hold up our end by adding new updates and field reports, monthly menu recipes, some op-ed work (and opinions we have plenty of!) and many other features. As we look back, we feel we’ve accomplished a lot. And we have plans for more changes and improvements in ’09 and beyond. a smile to our faces. First and foremost in our capitalist hearts, we have just added a retail section, A Gift Shop for Mushroomers. 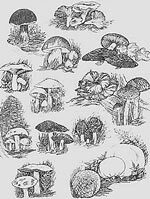 We’ve begun with a nice variety of unique, high-quality items that any mushroomer would appreciate (or you may decide you can’t live without!). They’re all very affordable, and we’ll be adding new products regularly. So if you haven’t already visited it, please do so, and let us know what you think. The web shop joins our existing Invite Us sections, in which we offer to come speak to your group about mushrooms, or to host forays in the fall, with you coming to join us. The A Gift Shop for Mushroomers and the Invite Us sections are the only segments of our ‘shameless commerce division,” as Click and Clack, the Tappet Brothers love to say on their beloved Car Talk program on National Public Radio, and the rest of our website will always be completely free (and hopefully useful!) in every respect. We’ll continue to offer features on preserving mushrooms, which has generated a lot of interest. 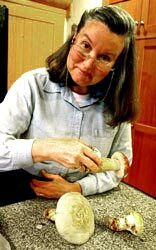 Mary has recently achieved Family Food Educator status with the Oregon State University Extension Service, and will continue to offer advice on these subjects in the website, as well as responding to specific inquiries from readers. Cooking is also a major area of interest for our readers, so we’ll continue to offer new features on cooking and recipes, including our very popular Incredible Edibles - Recipe of the Month. And since eating is the proper thing to do after cooking, we will also continue to offer occasional reviews when we find a restaurant that does something nice with mushrooms. And the Recipe Contest shall continue, so come on, you foodies – get those entries in! Our features on specific mushrooms - Morels 101 and Verpas 101, to name two - have proven popular, so you can expect those will be expanded considerably. And, of course, our field reports will continue and, in the future, we’ll strive to always be timely and current. Thanks, finally, to you, our readers. Your enthusiastic response has energized us to keep working on our website, honing and refining it, and adding new features. We would really appreciate hearing from you, with your comments, thoughts and suggestions. You see our website from a different perspective than we possibly can, and your input would be most welcome. And if you run across an area somewhere in western or central Oregon that always has way too many morels for you to handle, you can feel free to contact us about that, too! Good ‘shrooming! abundance of boletes in 2008! 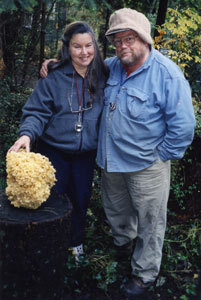 The pursuit of wild mushrooms has been a thoroughly absorbing interest of ours for over twenty-five years. The pursuit is not terribly difficult (they don't run very fast, after all!) and it takes us to beautiful places where we see many beautiful things besides mushrooms. We learn about trees and how they co-exist (or not!). We see and learn about wildlife, too, and find out which mushrooms are eaten by them (or not!). Wild mushrooming teaches us to observe, in some ways like photography does; we notice more as we walk and even drive through forests. Our observational senses are turned up to "maximum" when we are out there, and we notice things the casual hiker does not. In some ways, mushrooming is like an Easter egg hunt for adults. And even on those forays in which the mushroom gods do not smile on our efforts, we invariably see or find something that rewards us. When we hit our fifties, we had always planned to pull up stakes from the big city (first Portland, then Seattle, in our case) and move somewhere on the Oregon or Washington coast where we could live and do the things we loved all year round, rather than just on the sometimes too-short weekends. After an extensive search, we settled on the southern Oregon Coast, and found a heavily wooded parcel south of the little town of Port Orford in Curry County, 70 miles north of the California border. It seemed to have everything - good fishing nearby (both fresh and saltwater), lots of wild critters and scenic beauty everywhere we looked. But did it have good mushrooming? We were experienced gatherers, by this point, but our efforts had been limited to northwest Oregon and western Washington. We were delighted to learn after a foray or two that indeed there was fine mushrooming to be had here - many familiar species and a few that were new to us. We signed on the dotted line and never looked back. We were driving through Eugene, Oregon in early April near the Willamette River. 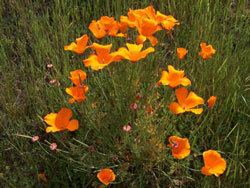 Steven nodded toward the land near the river and said, "Boy, that looks like Verpas." He was saying, in our verbal shorthand, that it looked like a good area to hunt for Verpa Bohemica, an early Spring mushroom sometimes called "the early morel" or "false morel." There were cottonwoods growing in the area, and the underbrush looked like there might be some nettles as well. The leaves on the cottonwoods were still tiny. He was right. It looked like a great spot for Verpas to me, too, but the point is that with our experience and interest in wild mushrooming, we looked at our surroundings differently and in more detail than we otherwise would, and we recognized an area that looked like a likely spot to find a certain, specific kind of mushroom. Yes, it takes a while to get to that point, but we do eventually reach it. We are not professional mycologists, a title that properly requires a college degree and a lot more scientific background than we will ever have. Rather, we think of ourselves as "experienced mushroomers," gatherers for our table and our enjoyment. We know what we know from years in the field, from reading and study, from membership in several mycological societies and from associating with bona fide experts in the field. Will we ever know as much as they do? Not a chance. But we also are always keenly aware of what we don't know and that is knowledge that can be of even greater value. There are over 2,000 species of mushrooms in the Pacific Northwest alone. No one could identify precisely every single one of these. We have learned to recognize a couple of dozen species that are safe edibles that we enjoy, and those are the ones we gather. We also recognize a hundred or so others that interest us for some reason, usually their unusual beauty, but which we either don't particularly like the flavor, don't know are safe to eat or, more directly, know are unsafe to eat. We may take them home (carefully segregated from the others in their own container) for further study or observation, but we never even remotely consider putting one in our mouths. The old adage, "Every mushroom is edible...once" is a good one for wild mushroomers to keep in mind. 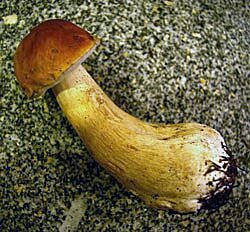 We also enjoy eating wild mushrooms in a variety of ways. Cooking is another interest of ours, and the unique flavor of wild mushrooms adds a whole new dimension to it. There is also undeniable pleasure in eating a dish containing mushrooms that we ourselves have chosen and gathered and, armed with the knowledge we have accumulated, know that we can eat safely. Mushrooms are a healthy and very flavorful addition to our diet and, the experts tell us, are a great source of minerals for our continued good health. Our mushrooming has been a fulfilling and thoroughly enjoyable hobby for us and we intend to pursue it for the rest of our lives. Just as there have been many friends we have made over the years who have taught us much of what we know, we recognize our own obligation to share that knowledge with others who are interested in these fascinating fungi. After all, the mushroom gods are watching! 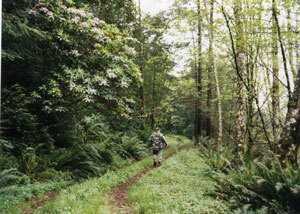 Rhododendron can grow tall in Curry County! the solitary hiker in our refuge one foggy morning.